Big news for the Dining Terrace at Westfield Montgomery mall: Urban Plates, a modern take on the classic cafeteria, is taking over the empty Naples space with plans to open next year. The California-based chain offers a variety of chef-driven food stations, allowing customers to choose from freshly tossed salads and bowls, hand-carved sandwiches, side dishes and scratch-made desserts. Foodies should be happy with this place, where the beef is grass-fed, the chicken free-range, the seafood sustainably sourced and the produce mostly local. Want a peek at the menu? Click here or head over to Tysons Galleria, where Urban Plates will open in mid-July. Want to know what other restaurants are on the way to the mall? Click here. The summer outdoor dining scene is starting to shape up at Montrose Crossing, with three new restaurants already open and two more nearing completion. 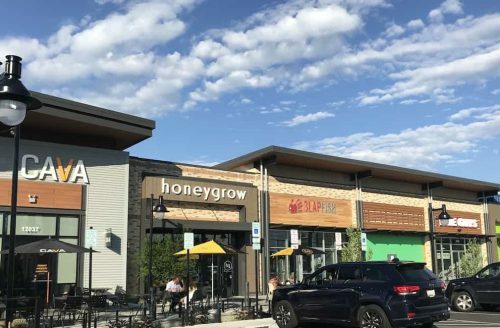 Slapfish and Five Guys will soon join Cava and Honeygrow at the center’s new restaurant row, while Honey Pig Korean BBQ is now open near Old Navy. What’s missing from the lineup? Pieology. The make-your-own pizza chain has dropped out of the project, and we’re still waiting to hear who will fill the last few spaces. As soon as we know, you’ll know. Remember the rooftop farm at Pike & Rose that we told you about last January? The first summer is off to a good start, with 17,000 square feet of crops including greens, root vegetables, herbs, tomatoes and peppers. Up Top Acres is overseeing the farm, which is said to be the largest of its kind in the Washington metro area. The food is being distributed to Pike & Rose restaurants, farm share members (maxed out for this year) and customers at the Saturday farm markets. For more info on Up Top Acres, click here. Did you miss these issues?